The enterprise data center has undergone several major shifts since the introduction of computing as a business resource. Data centers have evolved from mainframes to client/server to virtual servers, and then to being “software defined,” and finally to their current state of disaggregation. 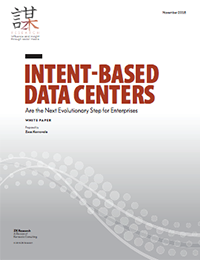 Today, we sit on the precipice of the next major data center transition—the evolution to an intent-based data center (IBDC). Each transition saw the cost of computing decrease and the importance of the network increase, and each one enabled organizations to boost the efficiency of their data center operations and improve asset utilization—ultimately leading to a better experience for users. The transition to an intent-based data center will be the most significant technology transformation since the birth of the internet, as the vision is to deliver autonomous operations across all IT infrastructure. In this white paper by Zeus Kerravala, Founder and Principal Analyst at ZK Research, he explores the transitions and explains the benefits of an Intent-based data center.